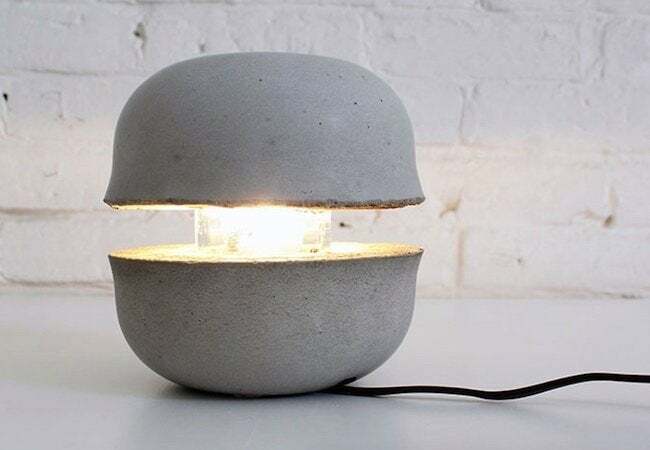 Add a playful, industrial note—and a little light—to your home with this simple DIY. concrete mix and some basic tools and materials, most of which you probably have on hand. Ready to get started? Gather your materials together and double-check that you’ve got the right components. 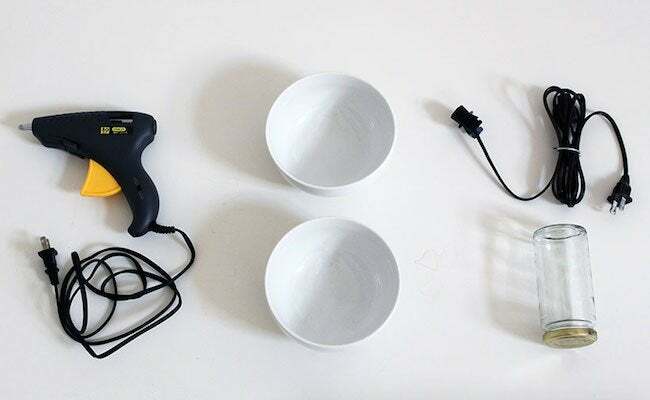 Note that because there’s a risk that one or both bowls may be destroyed in the course of the project, you may not want to involve your favorite dishes. If you happen to own two matching plastic bowls, consider using those; their flexibility may come in handy for a later step. Also, while you can certainly use any type of metal-lidded glass jar, it must be tall enough to rise up above the lip of your chosen bowls. Before deciding to use this or that jar, confirm that its interior comfortably accommodates both a smaller-than-standard light bulb and its appropriate socket. Place the jar, with its lid facing down, into one of the two bowls. Trace the outline of the jar on the bottom of the bowl. Next, place a generous, quarter-inch-high bead of hot glue along the ring that you drew. Having done so, add another similarly generous bead of glue in a straight, three-quarter-inch line projecting out from the initial ring. 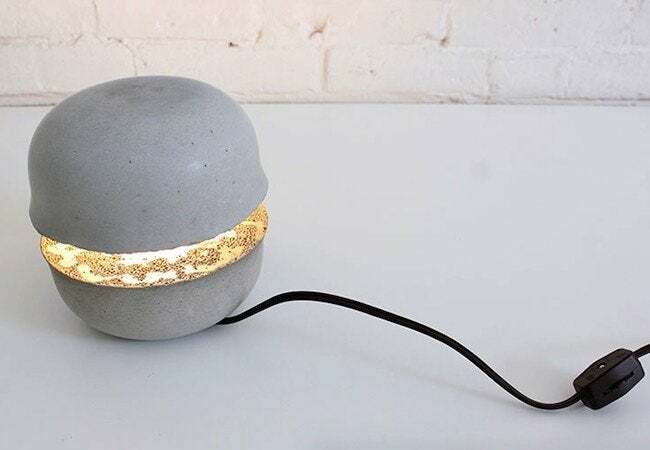 This line creates a channel through which the electrical cord can eventually run out of the jar and away from the lamp. Now, press the jar firmly into the glue (lid side down), but not so firmly that it displaces the glue and makes contact with the bowl. In other words, the jar should sit on top of the glue, not on the bottom of the bowl.
. Readily available at low cost, QUIKRETE® 5000 is specially formulated for high early strength; for that reason, it works well for any casting project. 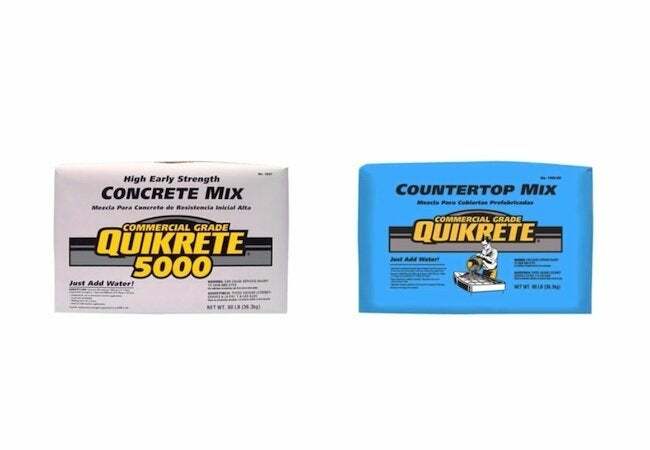 QUIKRETE® Countertop Mix is equally appropriate, though slightly more expensive. With no large pieces of stone or gravel, it’s particularly well suited to smaller and more intricate projects. 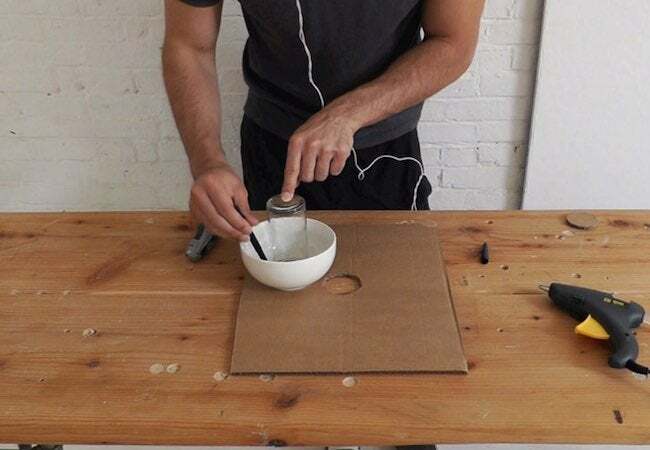 Following the instructions for your chosen product, mix at least enough concrete to surround the jar and fill the bowl all the way up to its lip. 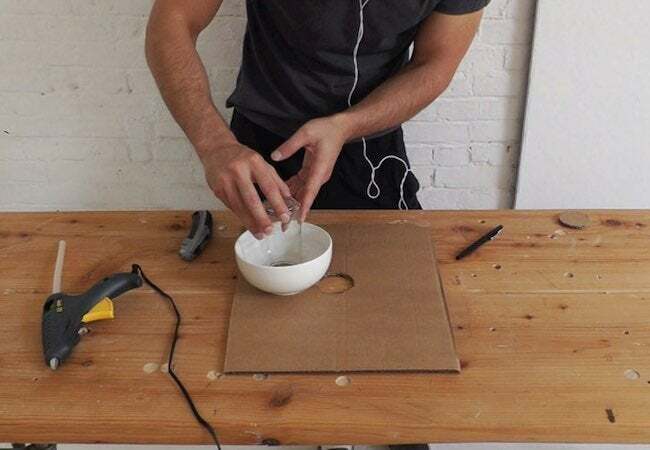 Vibrate the bowl to release any air bubbles, then let the concrete cure. Allow at least 20 hours for the concrete to cure. If the bowl being used isn’t flexible, allow up to 48 hours. Once sufficient time has passed, remove the concrete from the bowl. To do so, twist the jar and pull. If the concrete refuses to budge, it may be necessary to break the bowl with a hammer. When the concrete comes out, expect the jar to be lodged within a half globe of concrete. At this point, mix another batch of concrete and add it into the second bowl. Next, pick up the half globe with the jar embedded in it, turn it upside down, and position it so that the jar protrudes into the center of the second bowl, right into the wet concrete. 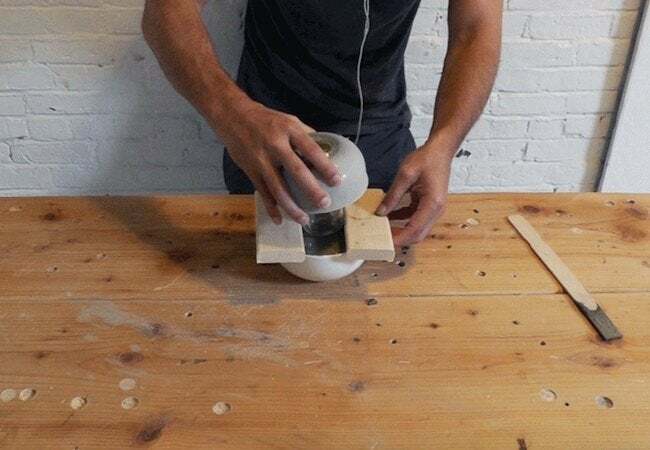 Use two equal-size pieces of scrap wood to maintain separation between the halves. Again, wait long enough for the concrete to cure in the bowl. When the concrete has dried, proceed to remove it from the bowl. Once you’ve done so, your lamp is nearly complete. All that’s missing is the bulb. To fit the bulb and socket into the lamp, drill a series of holes around the perimeter of the metal jar lid. From there, use a utility knife to cut out the lid, creating access to the jar. 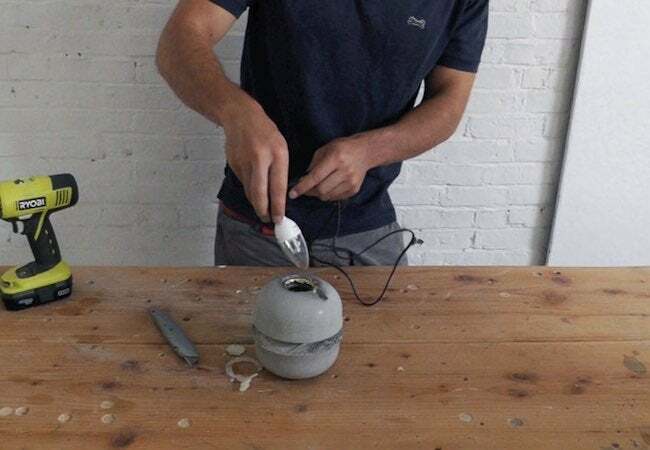 Place the bulb and corded socket into the jar, guiding the cord out through the channel you created by adding that extra line of glue in Step 1. That leaves only the last step: Plug in the socket and turn on the bulb!